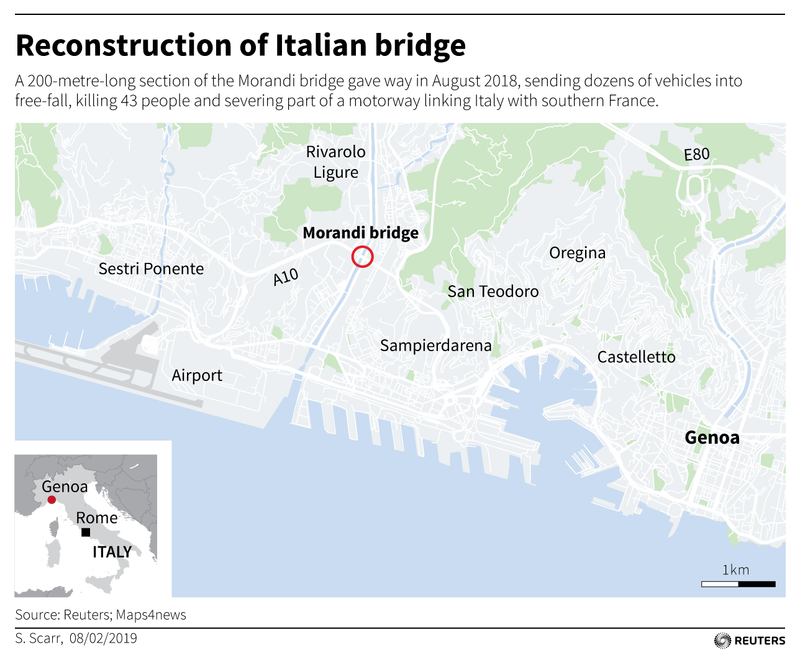 GENOA: Firefighters searched on Tuesday for survivors and bodies amid the rubble of a motorway bridge that collapsed in the morning in the northern Italian port city of Genoa, killing dozens. At least 35 probably died, Italy’s ANSA news agency said citing fire brigade sources, while the official body count remained at about 20. A 50-metre high section of the bridge, including a tower that anchored several supports, crashed down with as many as 35 vehicles driving on it onto the roofs of warehouses and other buildings, plunging huge slabs of reinforced concrete into a riverbed. Helicopter footage on social media showed trucks and cars stranded on either side of the 80-metre long collapsed section of the Morandi Bridge, built on the A10 toll motorway in the late 1960s. One truck was shown just meters away from the broken end of what locals dubbed the “Brooklyn Bridge”. Luigi D’Angelo, an official for the civil protection agency, said there were 30 cars and between five to 10 trucks on the road when the middle section came down. So far, 16 people have been hospitalized, including 10 in critical condition, the agency said. Some 300 firefighters were working in the wreckage, using sniffer dogs to try to locate survivors. Bucci from the Genoa police said rescuers would continue searching into the night. Four people have been pulled alive from the rubble, Ansa news agency reported. The office of Prime Minister Giuseppe Conte said he was heading to Genoa in the evening and would remain there on Wednesday. Defense minister Elisabetta Trenta said the army was ready to offer manpower and vehicles to help with the rescue operations.